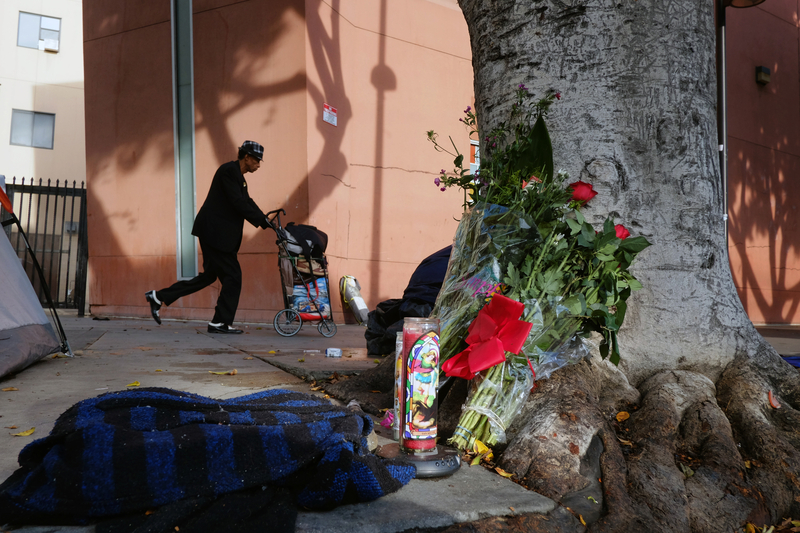 LOS ANGELES -- Los Angeles police officers were justified when they fatally shot a homeless black man on Skid Row six times, including twice in the chest, a civilian oversight panel said Tuesday. The decision, announced publicly by commission President Matthew Johnson, led to outcries from about a dozen activists in the room who have criticized the shooting and repeatedly called on police to release body camera footage that captured it. Afterward, the group held hands and prayed outside police headquarters. The video showed a group of officers getting into a scuffle with Keunang after reports of a robbery. At one point, Keunang allegedly appeared to try and grab an officer's gun, reported CBS Los Angeles. "To the family and friends of Mr. Keunang, my fellow Police Commissioners and I extend our sincere sympathies for your profound loss," Johnson said in a statement. Witness Yolanda Young told CBS Los Angeles in March that the suspect, believed to be Keunang, was in a tent arguing with another man and that he then began struggling with officers. "Next thing I know," said Young, "dude swung on a cop and the cop swung back. And they were hitting on him and then two other cop cars pulled up and they got out of the car and ran over there, and they had three tasers out." Joshua Piovia-Scott, the attorney representing Keunang's family in the lawsuit, has previously said that if police have nothing to hide, they should release footage from body cameras worn by the officers involved, which the department has declined to do. Keunang's death is among several involving the LAPD that have gained national attention in the last few years. Last month, Chief Beck recommended that prosecutors file criminal charges against an officer who fatally shot an unarmed homeless man in the back in Venice on May 5. The recommendation came after investigators concluded that 29-year-old Brendon Glenn was on his stomach trying to push himself up when Officer Clifford Proctor shot him. The decision marked the first time Beck has recommended charges against an officer who fatally shot someone while on duty. More than 100 such shootings have occurred since Beck became chief in late 2009. The police commission found that one officer was unjustified in stopping Ford in the first place but that another officer was justified in the final use of deadly force.